Mike Rosser has been an “R” Judge for the USEF (United States Equestrian Federation) for 3+ decades and is also a judge for AQHA ( American Quarter Horse Association). He has judged many prestigious horse shows, including Devon, Capital Challenge, Wellington, Menlo Classic, Washington International, The Royal Winter Fair in Toronto, Canada and The AQHA World Show. Mike and his wife Alicia own Reynard’s Ridge in Southern Pines, NC for over 30 years, where they have been teaching, training, foxhunting, and showing successfully. Offering services for starting young horses, training hunters and jumpers of all levels, and competing at the Medal-Maclay and Grand Prix levels, Mike and Alicia take a “building blocks” approach to training both the horse and rider. 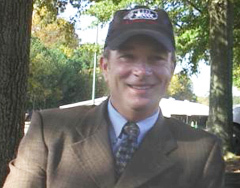 Mike was awarded the NCHJA (North Carolina Hunter Jumper Association) “Horseman of the Year” in 1998 and again in 2007, and is a past President of NCHJA . Reynard’s Ridge is located at the historic Young’s Farm in Southern Pines, North Carolina, and are directly adjacent to the Walthour-Moss Foundation, a 4000-acre nature preserve dedicated to wildlife and equestrian purposes. Our horses enjoy hacking the miles of wooded trails of the Foundation, making for a restive break from showing and training.